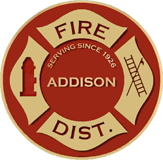 The Addison Fire Protection District operates out of three fire stations which are staffed with professional full-time firefighter/paramedics. The staffing is broken down into three different shifts…Black, Red & Gold. Each shift works a schedule of 24 hours on-duty which is followed by 48 hours off-duty. This schedule provides for emergency response within the fire district 24 hours a day and 365 days of the year. Calls for service are received and dispatched by the Addison Consolidated Dispatch Center, also known as ACDC. This agency started dispatching AFPD on March 28th, 2017. Learn more about ACDC by visiting their website at acdcdispatch.org. You can meet our professional emergency response personnel by clicking one of the shifts below.